shoulda cleaned the engine bay before putting the engine back in! looks like there's a few pounds of dirt there! i know i know. I'm running out of time though. It's not going to be ready for Autovation tomorrow - i ran into some problems tonight. The headers don't clear the x-brace - i think it's because the engine was lowered. So I cut the x-brace and will be welding some reinforcements. ugh this is progressing slower than I wanted. However, I got my shift linkage back in, the driveshaft in and aligned, and then fought with the x-brace the rest of the evening. My SRI came in today too. 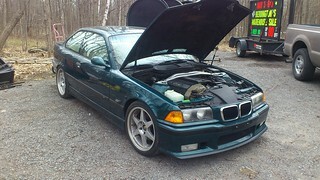 -drop off car at Autovation for exhaust work. it's going to be a LONG night! Are the ebay headers? If so, some they don't clear the X brace, even with OE engine mounts. Some include small aluminum spacers, about 1/2", that space the rear of the X beace down a bit to clear. Even then, mine rested right on the brace. Yes they are ebay headers. I tried shimming the xbrace, but the angles wouldn't work to get the bolts back in. I ended up cutting about half the tube out under the headers so that it would fit. I'll be welding in some reinforcements around the area so it doesn't screw up it's structural integrity too much. I gave them a call yesterday and told them it was a stainless exhaust and they said no problem, that they could do it. Realistically, as long as it doesn't leak, I'll be happy. Jamie (and Chris too) was a huge help last night. We lost a lot of sleep but got quite a bit done. All I have left to start is to fill the rad with water, wire in the wideband O2 sensor, and put the fusebox back together. There are a bit more wires that can be removed so I'll take care of those at the same time. I was too tired last night to download the pics, but I took a bunch of the xbrace mods and the intake. I'll try and post them tonight! And the new SRI - it looks like a car again! Got a call from Autovation - exhaust will be done by tomorrow morning. Awesome!! I'm totally going to have to make time to pop by some time when you're working just to say hi and check things out. Bear, send me a text!! Sounds great Jay! I'll be there pretty much every night this week (except tonight) doing odds and ends - have to grind some welds to fit the seats, fix a spark plug issue (possible piston contact), package the wiring, install the belts, swap rims, install the dash. BTW - Autovation did a great job on the exhaust. Next time she's on the lift I'll shoot some pictures.